The Order of Malta—What does it mean to be a member of a religious lay order? This is the first in a series of instruction from Chaplains of the Order on aspects of our Catholic life and the challenges of choosing to grow spiritually by our membership in the Order of Malta. By Fr. Joseph R. Johnson, Ch. M.
Most of us have been asked more than once to explain what the name of our organization means: “Order of Malta—what’s that?” How many times have we been stumped in trying to give an adequate reply? We may mumble something about starting at the time of the Crusades and then quickly move on to talking about our work today caring for the sick. We usually make use of the shorthand “Order of Malta” because it is quite the mouthful to pronounce the full name: “Sovereign Military Hospitaller Order of Saint John of Jerusalem of Rhodes and of Malta!” Unfortunately we rob ourselves (and others) of a better understanding of our identity when we omit so many words which shed light upon the various rich aspects of who we are, where we came from, and what our purpose is. Despite Shakespeare’s insistence to the contrary, there is actually something to this whole business of names. How much thought, and sometimes angst, goes into naming a child? The name needs to be just right and it will encapsulate something of the identity of the person. Or what about creating the name for a new company? Marketing professionals will tell you that so much of its success or failure will depend upon branding a name for the organization that captures its essence. The same is true for us! How important is a name? Most of us get so many emails and so much junk mail that we don’t even open many of them. We perform a rudimentary triage to decide what goes into the trash and what we will actually spend time reading. What is the deciding factor? It usually comes down to seeing the name of the sender. I would be willing to bet that most of you acknowledged the sender was the “Order of Malta” before deciding to read this! First, we know that to become a member is considered by some to be a great honor. This is knighthood with a distinguished, historic pedigree. The arcane geographic places in our full name allude to glorious adventures of the past with battles fought by men in shining suits of armor! True enough, but we know of other “knights”—what distinguishes us from them? Most dioceses in the United States have very active groups of the Knights of Columbus. 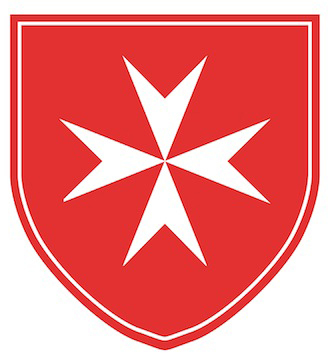 They are called “knights” and hold high ideals of chivalrous service but they are a fraternal association rather than an “order.” What about the “Equestrian Order of the Holy Sepulchre?” That word “equestrian” means more than the fact that they historically had horses and the Order of Malta usually had ships—not simply an Army vs. Navy distinction. They are also knights but the word “order” in their title refers to a hierarchical form of governance rather than what it means in our name. It would be a grave misunderstanding to think of the honor we have been given and not think of the even more important duty we have assumed of service to the sick and the poor. We don’t have to look very far to find the sick and the poor—and we are expected to find ways to serve them! Pope Francis speaks of those on the “peripheries” of society whom we are called to serve. In fact, Jesus tells all Christians that whatsoever we do or don’t do for the least of these is taken as care for or neglect of Jesus Himself (cf. Mt. 25:40). Practical, hands-on service must be discerned according to the needs of my area and the circumstances of my state in life. Not to serve is not an option! That said, there are many service organizations. What makes us different from the International Red Cross? A funny thing about the Red Cross societies is that they become Red Crescent societies in Muslim countries. I can assure you that you will never find a crescent on this group’s flag—our founder Blessed Gerard would roll over in his grave at the very thought! We have a white cross on a red background always and everywhere. Our official hymn is “Ave Crux Alba” or “Hail, O White Cross!” This same cross is emblazoned on our attire and reminds us of the third aspect of our organization that should frankly be self-evident: we are unapologetically Christian. Witness to the Gospel is in our organization’s DNA. We serve the sick and the poor but we also commit to defending the Faith—the two go together. Our adherence to the Catholic Faith should be manifested by our moral conduct, our ongoing learning and sharing of this Faith, and our service. As Blessed Teresa of Calcutta often said of her Missionaries of Charity: “we are not social workers.” We are not motivated by various things such as a paycheck or a place of honor in church or generic humanitarian inclinations. We are followers of Jesus Christ! The teachings of the Church are often opposed by modern society. The sanctity of human life and God’s plan for the complementarity of man and woman are not commonly accepted by many communities nor protected by our nation’s laws anymore. It was prophesied of Jesus and He Himself understood His mission to be “a sign of contradiction” to the world. We need the fortitude of our warrior predecessors to remain faithful to the Gospel and indeed proclaim anew the beauty of Jesus Christ as the Savior to a broken humanity sinking in selfishness and meaninglessness. Pope Benedict XVI described the present situation as “the dictatorship of relativism” but we possess the antidote in confident knowledge of the absolute truth of Jesus Christ, the Son of God. Honor, service, witness… three important aspects of the Order of Malta but we still haven’t actually touched upon the essence of who we are and why we do what we do. It goes back to that little word which we usually skim over: “order.” We spend a lot more energy explaining how Malta was the penultimate stop in our group’s bumpy journey from Jerusalem to Rome than we do on what it means to be an order. The word “order” certainly indicates that we are governed by a hierarchical structure headed by a Grand Master and that we strive to live lives ordered according to the principles of our Faith. It belies the fact that in most activities in the Church, there is also a lot of chaos and we are certainly not exempt from that! Our title’s use of the word “order”— perhaps surprisingly to some of our own members—refers to the common usage found in religious circles when we speak of the Franciscan order or the Dominican order or the Benedictine order. We are in fact members of a religious order of the Catholic Church! Not just any order, but one of the most ancient as Blessed Gerard founded our order over a century before Saint Francis or Saint Dominic founded theirs. It seems incongruous to most that we should belong to a religious order since the vast majority of our members are married and have secular jobs. That said, the “heart” of our order is what is called the First Class: the members who profess vows of the evangelical counsels of poverty, chastity, and obedience. Just as the physical heart is much smaller than the body, so these members are a minority but the essential element to the life of the whole Order of Malta. It would not be an “order” without them! There is a Second Class whose members make a promise of obedience instead of professing the three vows. These Knights and Dames in Obedience freely oblige themselves to “strive for the perfection of Christian life in conformity with the obligation of their state, in the spirit of the Order” (Constitutional Charter, article 9, section 2). The Third Class—to which most of our members belong—requires a simple commitment to the mission of the Order of Malta. They devote “themselves to the charitable activities of the Order according to the provisions of the Code” (Constitutional Charter, article 9, section 3). The three classes of the Order of Malta do not reflect degrees of greater or lesser prestige but rather increasing degrees of self-sacrifice. Our patron Saint John the Baptist gives us the stirring reminder “He must increase, I must decrease” (Jn. 3:30). Saint Paul makes more explicit the meaning of the entire Christian life: “it is no longer I who live but Christ who lives in me” (Gal. 2:20). Profession of vows, promise of obedience, commitment to the mission of the Order… three ways of living the same charism given by God to Blessed Gerard over 900 years ago. What is this spirit gifted from Heaven that is meant to guide us? Some may respond obsequium pauperum and tuitio fidei, the Latin mottoes which summarize the service and witness aspects of the Order upon which we have already reflected. That is a good description of what we do but not yet the entirety of who we are! Let’s go back to that original question so often posed to us: “Order of Malta—what’s that?” Our official documents direct us that: “The purpose of the Order is the promotion of the glory of God through the sanctification of its Members, service to the faith and to the Holy Father, and assistance to one’s neighbor” (Constitutional Charter, article 2, section 1). How many of us reply to that common question that it is a religious order aimed at the glory of God through the sanctification of its members? The obsequium pauperum and tuitio fidei are means to the end but not the end itself! Herein lies the great difference between the Order of Malta and other organizations we have mentioned. The Order provides the way for its members to become saints. Far more than doing good works, the Order is our path to Heaven. 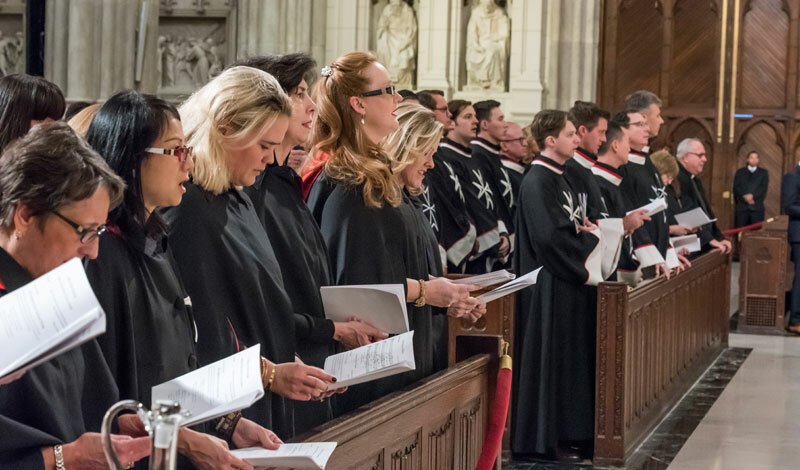 In a way similar to those who become Benedictine oblates or Third Order Franciscans or lay Carmelites, the members of the Second and Third Classes associate themselves with the vowed religious of the First Class in seeking holiness by praising God through the gift of their lives in the Order of Malta. There is a distinctive spirituality in the Order of Malta that should guide us. We are first and foremost disciples of the Lord Jesus seeking to follow Him more closely by living according to the way revealed to our founder Blessed Gerard. The eight points of our white cross symbolize the eight Beatitudes taught by Jesus in the Sermon on the Mount (cf. Mt. 5). The Ten Commandments are the starting point for Christian life rather than its goal. Saint John Paul II described the Beatitudes as the self-portrait of Jesus. As members of the Order of Malta, we are called in a special way to meditate upon and put into practice the Beatitudes. Blessed Gerard shows us how to use our service and witness to live them and thus shape our lives to be ever more Christ-like. What does it mean that we belong to a “religious lay order?” At first glance these adjectives seem contradictory. How can something be both religious and lay at the same time? “Religious” refers to the vows taken by the members of the First Class. “Lay” refers to the fact that this order is not primarily composed of priests and deacons. There are priests and deacons who are members of both the First and Third Classes but they are a minority and fall under the special jurisdiction of the Prelate of the Order. Those who have received the sacrament of Holy Orders are at the service of the Order but do not constitute its primary element. Belonging to an order is by definition otherworldly. There is no earthly treasure to be gained in it and even its earthly activities are meant to redound to the glory of God. Through it, the light of Heaven shines on our journey in this world. We are on a pilgrimage of Faith and we approach our destination not by travelling to any place here on earth—not even Jerusalem, Rhodes, or Malta! Blessed Gerard left his homeland on the beautiful Amalfi coast to journey to the Holy Land because that is where the Incarnation occurred. God came down to earth so that we may ascend to Heaven. In the Passion and Resurrection of Jesus we find our invitation to be freed from sin and rise with Him to eternal life. Our spiritual transformation needs to unfold wherever we are by cooperating with the Holy Spirit. By detaching ourselves from this world and placing ourselves at the service of others, we manifest the “eschatological” dimension of the Order. That is, our very lives begin to point to Heaven. Our participation in the Order of Malta becomes a voice echoing our patron Saint John the Baptist “crying out in the wilderness, make straight the path for the Lord!” (Jn. 1:23). Pope Francis has designated these months from Advent 2014 to February 2nd, 2016, to be a “Year for Consecrated Life.” Our Grand Master recently quoted the Holy Father in saying of members of religious orders that “they are men and women who can awaken the world. Consecrated life is prophecy.” Saint John the Baptist was the last and greatest prophet pointing to Jesus. May our Order dedicated to Saint John continue to do so for centuries to come! For this to happen, we must know the charism of Blessed Gerard and live it fully while inviting others to do so as well. The Holy Father has exhorted us to study the inspirations of our founder and immerse ourselves more fully in the life of our Order. What is common to all orders is that they don’t conform the Gospel to the lives of their members but rather seek to stretch their members to the fullness of the Gospel. We should prayerfully examine how we can enter more fully into this rich spiritual tradition. How faithfully are we living our vocation as members of this Order? Do we make time for daily prayer, especially attending the Holy Sacrifice of the Mass and praying the Liturgy of the Hours whenever possible? Have we made the corporal and spiritual works of mercy priorities? Have we discerned whether or not God is calling us to a deeper participation as a Knight or Dame in Obedience? Are we encouraging young people to join us? Are we praying that more men will respond generously to God’s call to profess vows in the First Class? Do we take seriously the faithful witness of our Order stretching back nearly a millennium and our responsibility to hand it on for another generation by not wavering in the face of the challenges of our day? The Blessed Virgin Mary is the model for all those who seek to draw close to God. Pope Francis reminds us to turn to her in our need: “I entrust this Year for Consecrated Life to Mary, the Virgin of listening and contemplation, the first disciple of her beloved Son. Let us look to her, the highly-beloved daughter of the Father, endowed with every gift of grace, as the unsurpassed model for all those who follow Christ in love of God and service to their neighbor.” Our Lady of Philermo, protectress of the Order of Malta over so many difficult centuries, pray for us!